Happy Sunday Funday! My brothers have both left me from their holiday visit and I know I'll miss them both terribly. They're both so vibrant and fun, and incredibly thoughtful. It makes me wish that we all lived closer to each other, especially now that I have a daughter. I'm sure she'd love to spend more time with her entertaining uncles! It's times like this that really makes me enjoy holidays, because spending time with family is priceless. 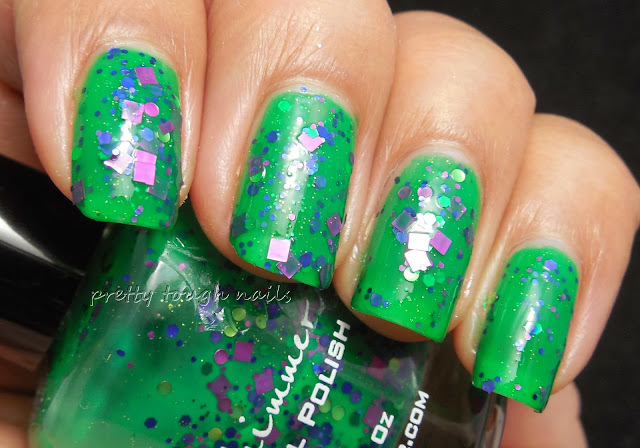 To help closeout the Christmas spirit, I have a bright almost neon green KBShimmer for you called The Dancing Green. 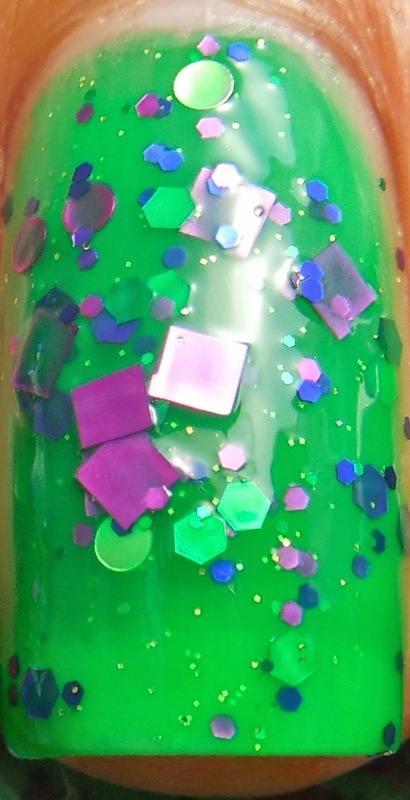 The base is a near jelly electric green packed with dazzling variety of glitter from gold and fuchsia circles, gold microglitter, purple and fuchsia hexes, and a smattering of fuchsia squares. I used three coats here, and the surprisingly liquid formula was not difficult to apply. There was no pooling or significant stacking of glitters, and minimal glitter drag. The glitter ratio to base was good, in that the polish application itself and final mani weren't overwhelmed with glitter. It dried quickly to a matte finish and called for a good layer of topcoat to add luster and shine. I thought this would be a good transition out of Christmas polish because it has the bright Christmas green feel to it but instead of red, there was a generous amount of purple and fuchsia glitters. The colors make it a non holiday polish that's perfect to wear year round. The bright colors are a great pick me up from the vampy polishes of winter and fall, and help me anticipate the beginning of a new year. Are you sad to see 2013 on its way out, or are you ready for a new start? This polish is so awesome! I love how bright and unique it is. I really need to add it to my collection. I think you need to!! I was lucky to snag this in a blog sale.... Hopefully another will turn up soon!